Fine grain, white mortar with polymers that is suitable for creating styles on any interior building surface. All walls and ceilings made of plaster and concrete, drywall, cement boards and aircrete, as well as most wood surfaces that are properly prepared, become suitable substrates to be decorated with MATIZ Stucco Decorativo. Strongly adheres on properly prepared surfaces, applies with great ease, spreads effortlessly and allows the craftsman to experiment with it until the desired result is achieved. 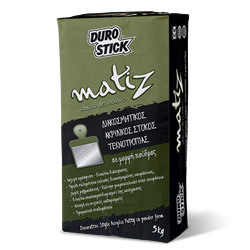 MATIZ Stucco Decorativo is resistant to daily use of the spaces it is applied on, it does not crack nor burst, and is applied on previously painted or unpainted surfaces safely and permanently. Its white color is the base to create a limitless range of colors using the measuring system for shade rendering, DUROCOLOR of DUROSTICK. The coloring system DUROCOLOR consists of liquid pigments in 20ml syringe packaging, available in 20 basic colors. Pigments so powerful that each single drop creates a unique color, exclusive to you only. Classified GP: CS II/WO per EN 998-1.